Manly is a suburb of northern Sydney, in the state of New South Wales, Australia, 17 kilometres north-east of the Sydney central business district and is the administrative centre of the local government area of Manly Council, in the Northern Beaches region. 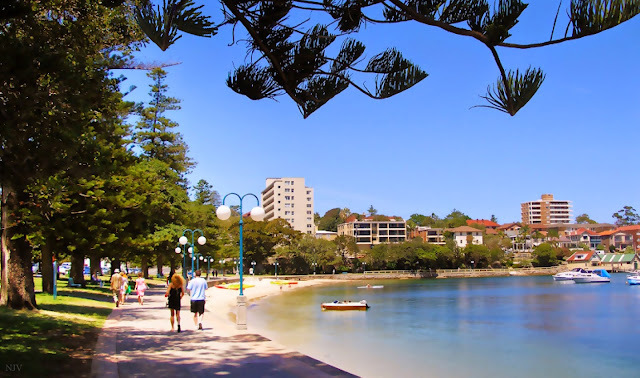 Manly was named by Captain Arthur Phillip for the indigenous people living there, "...their confidence and manly behaviour made me give the name of Manly Cove to this place". These men were of the Kay-ye-my clan (of the Guringai people). While scouting for fresh water in the area, Phillip encountered members of the clan, and after a misunderstanding he was speared in the shoulder by one of the clan; to his lasting credit, the progressively-minded Phillip ordered his men not to retaliate. Manly is most notable for its sandy beaches right on the Pacific Ocean, which are popular tourist destinations. Manly features a long stretch of sand on the ocean side, that runs from Queenscliff Beach to North Steyne Beach and Manly Beach. This is followed by rock pools and sandy beaches called Fairy Bower and Shelly Beach. There are also a number of beaches on the harbour side of the peninsula. Norfolk Island pine trees are also symbolic of Manly and are a prominent feature of both the ocean and harbour beaches. Great looking image. It's going to be freezing here in Arkansas tonight and for the next few days. Looks peaceful! It's always so busy when we go!